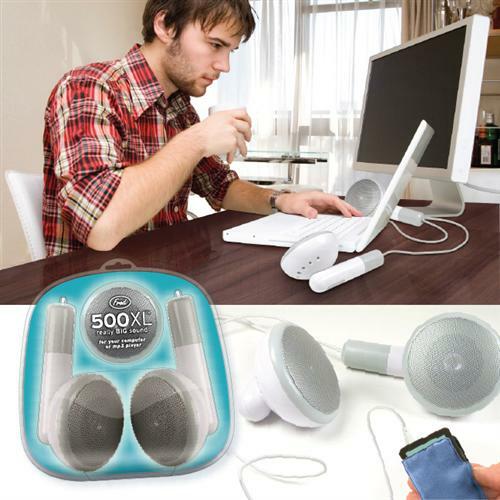 500XL Giant iPod Earbud Speakers | OhGizmo! I’ve never thought that the iPod earbuds were that great, but I guess they’ve become something of a tech fashion statement. If you’d like to leave people in absolutely no doubt that you’re cool enough to be listening to an Apple product, consider getting yourself a pair of these desktop size iPod earbud speakers, which are supposed to be 500 times larger than the originals. They have a built-in amp and they’ll run on USB, AC, or battery power, so you can in fact attach them to your iPod and wander around, trying to stuff them into your ears. They’ll be available soon from Perpetual Kid for $40. While that looks cool…why does it look like a photoshop? I’m guessing you’re right on the questionable photoshop job, but I’m pretty sure it’s a real product. yeah, finally ive got earbuds for my pet elephant! uhhh dude they arnt photoshopped im having a school fun raiser and thats one of the prizes on the list.